Escape to our private and beautifully appointed spa area, where you can indulge yourself with a massage, body wraps & scrubs, facials, and nail treatments. Here you will discover ritu- als and techniques to inspire body, mind and soul… pure essential oils, botanicals and natu- ral ingredients. For the ultimate spa experience from a unique perspective, ask for the top-rated Eminence Organic Facial treatments. Share a special couples’ massage or prepare for your vacation with waxing, eyelash extensions, or a new look for your hair. The owners have taken everything into consideration. The products that they use are non-toxic, ppd, (a known allergen) and ammonia free. No typical “salon smell” here! 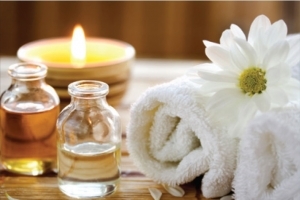 Just the beautiful scents of aromatherapy to relax and rejuvenate your spirit. Every little girl wants to be a princess. She can be “Princess for a Day’” at her special party where your little diva and her little bff’s dress, up, get their hair and nails done, finish off with a mini pedicure, then grab the micro- phone and karaoke to their hearts content. It’s a brand new concept for the Lower Mainland. Give her a birthday party they will be talking about for years! We’ll supply the costumes, the feather boas, the mini-spa services and food and refreshments. Your party is video-taped so the party lives on! It’s a day of magic she’ll re- member forever. How about quality grooming for men? Guys, sit back, relax and be pampered with one of Mantra’s most popular services! In our spa, they can receive an extra level of service with a stress-reducing neck and head massage. 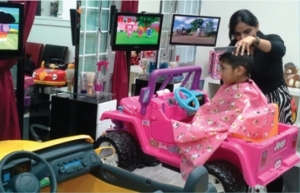 The KidVenture Zone has the popular “car” seats that will entertain the little ones while they get their haircut. Our flat-screen tv’s are a great hit with the tweens and teens, as they can connect or play videogames while getting their hairstyles. a full service Family Salon designed with an awesome new you in mind.